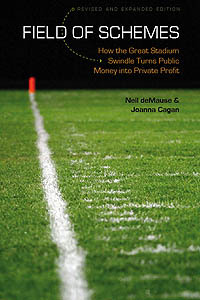 This entry was posted in the sports-media complex, Washington NFL team by Neil deMause. Bookmark the permalink. Remember that the Post is now owned by Amazon.com (yeah, I know, that’s not 100% accurate, but neither is the Post). Big business supports big business, always. It is not. It’s personally owned by J. Bezos, the current CEO of Amazon, but not by Amazon its self. Calm down..I believe Mr.Hofmann was making a clever joke. I figured that was the case, but I’d like jokes to be technically correct. Which honestly is the best kind of correct. It’ll be fun to read their article about the huge settlement they end up paying to Scot McCloughan. “An economic engine to the Washington area”? Yep, a better football stadium could put this little Washington burg on the map. That couldn’t drive the economy of a 50,000 person rust belt town, much less DC. The Post has not practiced actual journalism for some time. There are times when it is more of an alternative facts aggregator than anything else. Like TMZ, only less user friendly. It should be no surprise that it chooses (I assume this was a voluntary decision and not a transaction of some kind) to act as mouthpiece for the wealthy. The Post does some outstanding work, and some that is just garbage. I have no inside information at all, but I get the sense that since Bezos took over, all standards are gone, so loose cannons are ranging all over the place, to both good and bad ends. They lost me for good when they started presenting internal Pentagon memos as being the result of their own investigative journalism. Still read George Will though… but not very often. Wait a second…I thought that was CBS News that did that. It’s hard to feel sorry for Virginia being the target of a shake-down when the Governor is asking for it. You know that when the governor of Virginia approves a stadium subsidy, it doesn’t actually come out of his personal bank account, right?